Home > Dassault Systèmes S.A.
Found one file extension association related to CATIA MultiCAx plug-in and 1 file format developed specifically for use with CATIA MultiCAx plug-in. The MultiCAx products provide the ability to handle proprietary data from a large number of CAD systems. The MultiCAx products allow the import of 3D data from I-DEAS, Pro/ENGINEER, Unigraphics, SolidEdge, Inventor, SolidWorks, ACIS, Parasolid, DELMIA, CATIA Version 4, CATIA Version 5 and various other formats (IGES, STEP, STL, SLP, OBJ Wavefront, VRML, I-DEAS IFF). The MultiCAx products also support 2D data from AutoCAD (DXF) and Unigraphics. The MultiCAx products may be used in conjunction with DELMIA Portal products to visualize a multiCAx digital mock-up, with DELMIAVPM and DELMIA LCA to support management of product structures that include multiCAx parts and in conjunction with CATIA to enable data coming from non-CATIA systems to be used in a hybrid product development environment. When these products are used with DELMIAVPM or DELMIA LCA, they allow original multiCAx assemblies and/or part definition data to be stored as documents in the vault. Part definition data is converted into CGR (and, for DELMIA LCA, NCGM) format and stored against the relevant part. In the case of DELMIA LCA, assembly structures and new parts can be created in the database. A stored assembly can be extracted from the vault and modified in the original editor. Changes can then be stored back into DELMIA. Assemblies made up of mixed CATIA and other CAx geometry can be loaded into CATIA V5 or DELMIA DMU from DELMIAVPM or DELMIA LCA, modified and changes stored back. Assembly support: Where assemblies are supported, the links they carry towards component parts are resolved, allowing complete assemblies to be automatically and accurately inserted into the digital mock-up product structure. For some plug-ins used in a Windows environment, translation does not require a license for the source CAD system. 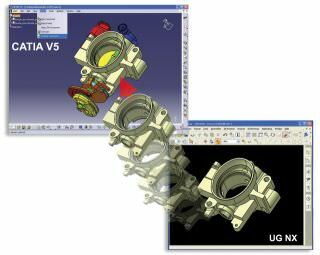 Many customer environments involve the use of multiple CAD/CAM products, either 2D or 3D. This may be because over time, as one CAD product replaces another, it was necessary to keep a minimum number of the previous systems licenses to maintain the data. Or perhaps the different products satisfy different requirements across mechanical, electrical or software development departments. Then again, in an extended enterprise where multiple suppliers are exchanging data, it may be that members of the engineering supply chain use different CAD systems. In all these cases, full design-in-context capabilities are only available if the designers are able to use the CAD data whichever tool it comes from. MultiCAx products provide the ability to convert foreign CAD data from its native format into a format compatible with a digital mock-up development environment and to support collaborative work for implementation of best practices such as review, interference detection, kinematics, fitting and so on using DELMIA Portal. Customers using CATIA can benefit from the multiCAx environment made possible by these products to optimise their design-in-context design practices by using mixed CATIA and multiCAx geometry. If you need more information please contact the developers of CATIA MultiCAx plug-in (Dassault Systèmes S.A.), or check out their product website.